When we say “organic” mattress, we mean that the Savvy Rest mattress is made from the purest, most healthful materials. And we don’t use the term casually—our mattress materials are certified organic wool, certified organic cotton, and the purest natural latex (natural foam rubber) that exists. 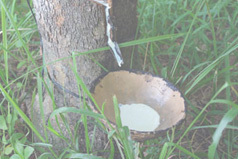 Our Dunlop latex is certified organic to Global Organic Latex Standards (GOLS). Our natural Talalay has achieved comprehensive Cradle-to-Cradle certification. Industry-wide, there is no clear-cut definition yet as to what is an organic mattress and what is not. So, while the industry is evolving standards, currently it’s up to each manufacturer to determine their own. This means more research and verification on the part of the savvy consumer. We post our certifications and test results here. As more manufacturers produce “green” mattresses, more creative descriptors are used to describe them. Many are just appealing names such as eco mattress, green mattress, environmentally friendly mattress, and so forth. Such comforting terms boost sales, but it’s sometimes hard to detect greenwashing. Some manufacturers self-certify (create their own definition of, or catchy name for, “organic” -- and then declare their material organic), make empty claims, or exaggerate their products’ purity. The trend has even reached some large discount mattress stores that carry very conventional mattresses. Some are pitching certain models as environmentally friendly—when closer scrutiny reveals only a minor evolution in the materials. What portion of the mattress materials are certified organic? Are any other materials used independently tested for purity? Who is the testing lab or the certifying agency? It is reputable or well known? The U.S. Department of Agriculture (USDA) is the only organization that publishes U.S. legal standards for the term “organic.” If you’d like to learn more about organic materials, including cotton and wool, requirements for the U.S. National Organic Program (NOP) are detailed here. Perhaps the most respected certifier of organic materials in the United States is Oregon Tilth. Their website can be viewed at http://www.tilth.org. The terms green, eco, or environmentally friendly are sometimes sincere efforts to create and uphold better standards, but are also frequently used purely as marketing terms. For example, there are mattresses labeled “green” that use 20% soy visco, and call this blended material “natural memory foam.” The resulting mattress can be 80% petroleum products and 20% natural. Of course, using some soy is better than no healthful ingredients at all, but how green is a mattress that’s 80% petroleum products? There are also labels for “eco mattresses” and “environmentally friendly mattresses” that even contain conventional chemical flame retardants. In terms of sustainability, most of the content is not green at all. If you’re looking for an organic mattress, you’ll want to do some homework on the company and products you’re considering. Evaluate whether the product is focused on certified organic and independently certified materials. If a company says that a material is certified organic, they should be able to produce a legal organic certificate. Just as importantly, in your search for purity and sustainability, don’t forget mattress comfort and your own quality of sleep. And don’t panic. Once you’ve learned these basics, you can make a conscious purchase that not only won’t keep you up at night, but will give you the sound, refreshing sleep you need. Our Dunlop latex is certified organic according to GOLS.